[1.] The first item I've chosen is a pair of black wedges i found on Ebay. I've been lusting after them for ages, and I'm really tempted to treat myself. But then i have to ask would i wear them that much?! They are fab though! [2.] I got an engraved charm bracelet for my 21st, and I've been really bad and not kept up with it. I'd really like to add to the little collection i have. I've been meaning to get a scissor tattoo for ages (i have my reasons) so maybe I'll start by getting a charm first! [3.] My friend has this and it's AMAZING. I was so impressed when i tried it, deffo gotta get my hands on my own one! [4.] Loving trousers so much at the mo! I've already linked to these bad boys before, so as you can still I'm still eyeing them up. [5.] Alexander McQueen (along with Vivienne Westwood) is my all time favourite designer. Everything about him fascinates me, i would love to have a book filled with his collections. [6.] An amazing bracelet, and it needs to be on my wrist! I anyone knows anywhere where i can get a replica from then please let me know. I'm gutted i missed it being £67 on Net-A-Porter.com! I hope you'll have tons of presents and loved by love ones! yay for wedges, i have some a bit like that bit higher and i wear them heaps! they're surprisingly easy to walk in as well. love alexander mcqueen, that bracelet is amazing! xo. I'm intrigued about the scissor tattoo! 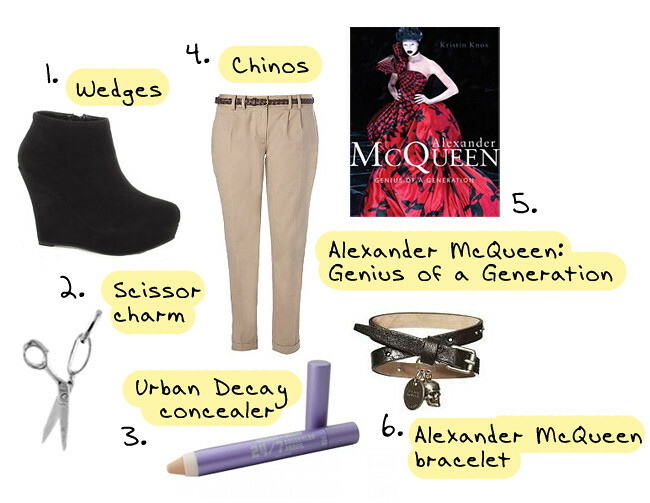 I did a mcqueen post that featured that book, from what you can see/read of it on amazon it looks really good! I have the concealer and I hate it haha! Just came across your blog and I already love it so much! We're both turning 22 on April :). I'm also not very excited but i really want to do something for this birthday because last year i didn't had a very time so i wanna make up for it. It may have been up for ages but I LOVE the gif of you waving :) made my day! I bought those New Look chinos online but they just didn't fit me very well, the waistline was so low it was skimming below my knickers, not good! I ended up buying some Zara trousers instead, and I love them. I have the book, it is awesome! I treated myself to it and i love it. Best concealer I've ever tried, hands down! It's awesome. Hope you get everything you want for your birthday my dear! that bracelet is gorgeous! love it! Love your picks I want that bracelet and that book is fab, it has some great photos from his early years.